As well as hot air ballon flights and helicopter flights, you can also get aloft with a number of companies operating Florida sightseeing and fun flights or even learn to fly. Florida's excellent weather makes it an ideal location to learn to fly. 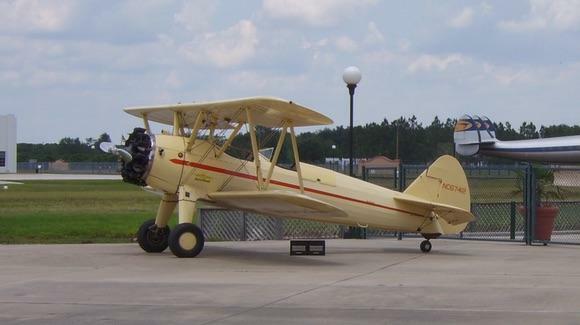 For pure enjoyment, everything is available from vintage aircraft such as barnstormers from the 1920s and 30s to World War II warbirds including trainers, fighter aircraft and bombers, right up to the present day with General Aviation and small passenger airplanes as well as simulated combat with advanced jet trainers and stunt planes for the real adrenaline junkies. Cessna 208 Grand Caravan which typically can seat 9 passengers and has a range of around 1,000 miles. Flying is a great way to see some of Florida's amazing landscape, particularly the Everglades and the Florida Keys or even to venture as far as the Bahamas. Some aircraft are equipped with floats allowing you to land just about anywhere. Flight costs with the Cessna 172 are around $200 per hour. Like most helicopter flights, everyone gets a window seat though it is usually up to the pilot's discretion as to who will sit up front in the co-pilots seat as this often depends on weight. If you weigh over 240 pounds you may not be able to fly so you will need to check with the operator. For safety reasons, flights can be cancelled because of inclement weather. As with all flights, don’t forget to take your camera with you! For a bit of real nostalgia, nothing beats flying in a vintage open cockpit biplane like a Waco, New Standard D-25 or Boeing Stearman. Most aircraft of this era were designed as trainers so typically have just two seats, one behind the other with the trainee up front and instructor behind. Expect to pay around $200 for a 30 minute flight. Some aircraft have been converted to carry more passengers so the cost per passenger is less, around $75 for a 15 minute flight. Because you are in an open cockpit, don't forget to wear comfortable warm clothing. The pilot will provide you with goggles and a helmet. For the real vintage aviation enthusiast there are a number of opportunities to fly in and even take control of some classic World War II aircraft including aerobatic flights if you wish. Because of the higher operating costs, these type of flights cost more than the usual pleasure flight so you can expect to pay around $200 for 15 minutes up to $700 for an hour in a T-6 Texan. Fighters such as the Mustang will cost considerably more. In Florida, you can fly in such classics as the North American T-6 Texan (Harvard), the TF-51 two seater Mustang and the North American B-25 Mitchell bomber. If you enjoy or think you would enjoy high speed aerobatics then you can fly in a jet trainer such as the two seater cold-war era Czech Aero L-39 Albatros or even in a stunt aerobatic plane. The L-39 will take you up to speeds of 500 mph and pull 4g while performing aerobatics, simulated combat manoeuvres and formation flying. If you have a cast-iron stomach you can get airborne in a stunt plane capable of pulling 12g and rolling at 360 degrees per second. Because of Florida's great year-round weather and visibility compared to many parts of Europe and North America, Florida has become a great place to go if you are trying to learn to fly and get your pilots licence. There are a number of Aviation schools offering intensive flight training courses where if all goes to plan you could get your pilots licence in around 3 weeks from start to finish. During that period you could expect to spend about 60 hours in the air (dual and then solo flights) before getting your licence. You can learn to fly gliders, ultralights or single engined aircraft. The actual flying training fees are around $4,500 for a glider licence and between $4,500 and $6,500 for a single engine pilots licence. On top of this there are various incidental costs plus accommodation and living expenses etc. As bizarre as it may sound, you can even join the "Mile High Club" whilst in Florida! At least one company offers discrete night time flights for two where the rear of the cabin is partitioned off from the pilot.